Late last year, a study by the Groningen Growth and Development Centre found Singaporeans worked an average of 2,287 hours in 2011. This puts us behind Hong Kong, which topped the list at 2,344 hours, but ahead of other global counterparts such as America, France and Japan. Today, thanks to technology making work only a click away, it’s easy to forget the importance of work-life balance and the importance of managing workloads better. Do you notice you often fall ill over the weekends or when you go on vacation? Coined “leisure sickness” by two psychologists from the Netherlands, this condition is a result of overworking and producing symptoms including nausea, exhaustion and flu or cold-like symptoms. So instead of spending the first few days of your holiday – or your entire weekend – in bed, make sure you’re constantly hydrated, eating well and working within your means to avoid a stress-fuelled crash. Probably one of the easiest ways to keep track of how well your body is function is to keep track of your heart rate. Take note of how many heartbeats your have per minute in the morning, afternoon and evening, making sure it’s within the normal adult range of 60 to 100 beats per minute. Anything higher than that, particularly in the morning, could be a sign that your heart is working harder to pump more oxygen to your body and brain. Another easy way to keep track of how your body is functioning is to look at your body’s output. Dark-coloured urine indicates a poor diet and lack of hydration, and the simplest way to get that back on track is to keep drinking water. Both chronic and sporadic constipation are also signs of stress and anxiety – one ore reason to make sure you’re getting plenty of water and eating right. 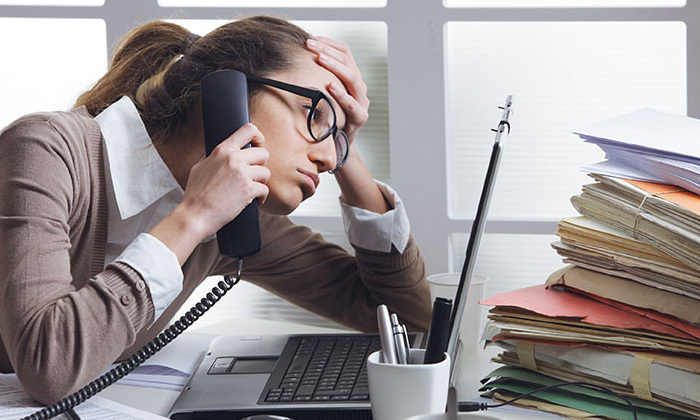 If you’ve noticed your colleagues avoiding you because you’ve been grumpy or irritable for no particular reason lately, you’re looking at another symptom of stress. Try taking a couple of short breaks throughout the day or make clear boundaries about working after hours. You could even consider taking a page out of France’s book and ban emails after office hours. Have you been waking up in the middle of the night, have trouble going to sleep, or wake up even more exhausted than you were when you went to bed? All signs of stress! Often our minds tend to keep working even after we’ve left the office, going through things that need to get done or mulling over events that have happened. When this happens, it can be impossible to quiet the mind enough to get a full night’s rest. Everyone has their preferred way of winding down after work – I personally like to go for a run a couple hours before bed, which gives me time to clear my head while well-exhausting my body so I’ll fall asleep as soon as my head hits the pillow. A loss or an increase in appetite are both signs of stress. Some of us have a tendency to skip meals to work while others might binge eat to help cope with stress. When your to-do list starts piling up, make a conscious effort to eat healthy – even if you’re not feeling hungry. Snack on fruit or vegetables if you feel peckish throughout the day, and make sure you’re getting all your important vitamins and nutrients. I would also highly recommend having a bit of chocolate from time to time. This will apply to civil servants working in Putrajaya, Kuala Lumpur, Johor, Terengganu, Perlis, Perak, Sarawak, Sabah and Selango..
Is this why female bosses are less popular than male ones? The highest pay increases in three years, and historically low inflation rates, means average real salary increases of 2.5% global..
Has Pokémon Go taken over your office? If you can't beat them join them, this local boss has decided to give his team half day off to play the game. ..